Biography – Michael Goodfellow taught at Meads College in downtown Alvaron for a couple of years after receiving his degree in Philosophy and History, and specialized in the Myths and Legends surrounding Humans. He was unsuited for teaching, being a little too scatterbrained and unorganized for the University. Rumors also persist that his backing of student political groups which opposed the more conservative views of the school may have also ended his tenure. He had always been fascinated by giant steam engines and when the possibility of traveling to human lands became a reality, he jumped at a chance to serve aboard the SS Aradan. The engine of the SS Aradan is under his sole care and he believes that he and the engine share some sort of spiritual bond. Captain Paul Setzar lets this go as since Michael has been hired, ships engines have been working flawlessly. 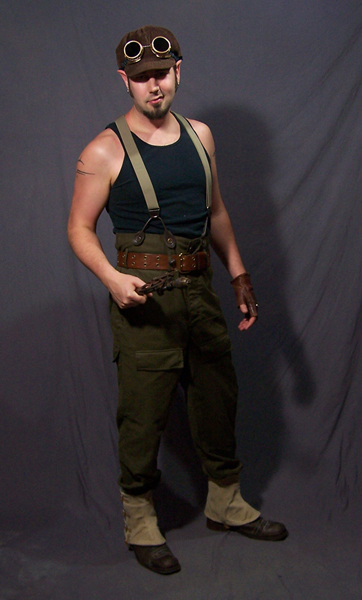 For the Cloth part of the costume I used a plain black hanes tank top and some Czech military pants. They come up real high and come with buttons ready for suspenders. Can’t beat that. A plain light brown corduroy newsboy hat with some flip top aradani goggles. The spats are a eastern european military canvas spat. They are one of the only ones I could find that would fit. Apparently the men who wore the spats in WW2 were very tiny men. 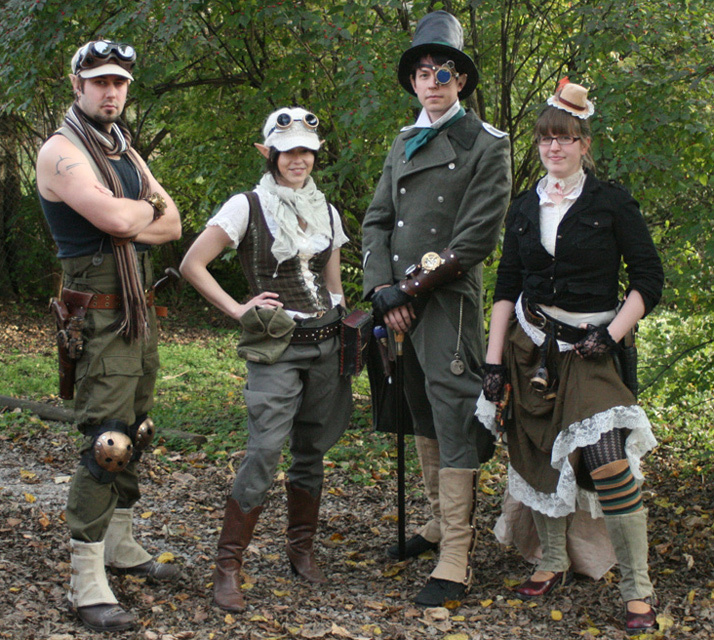 All of the vintage spats we ordered in were way too small. My boots are some really cool dress boots with brass rivets in the toe and heel. 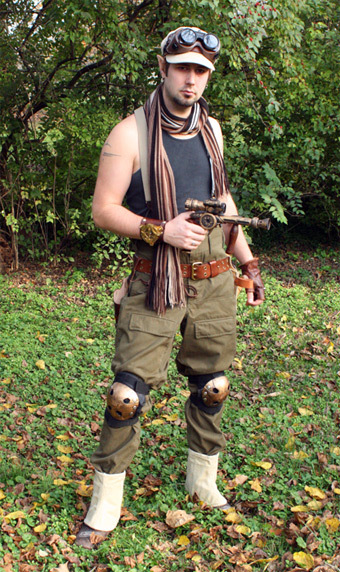 The parts I made for the costume are the gun, holster, whisky bottle holder, bracer, and the tool belt. The tool belt is a modded tool holder with costume leather piece and Aradani logo. I also got quite a few antique tools for the costume. 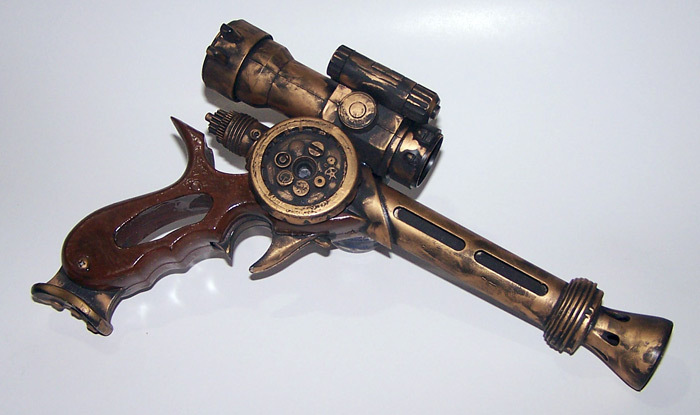 The blaster is made from a base Jango Fett gun, with added scope and accessories. I then painted it a matte enamel black and used brass rub to add the weathered highlights. We are thinking of mass producing these as a resin cast gun (which will run about $30 a gun), so if you are interested, drop us a line so we can judge the interest. The holster was a custom design and pattern. First I cut the basic pattern in poster board, just to get a basic shape. I then transferred it to leather and trimmed as needed. 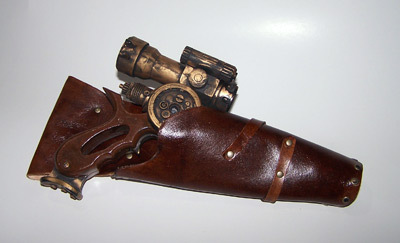 In the end I also wet molded the leather to the gun so it would hold its shape. The bracer was made by my brother because I was quickly running out of time before Dragoncon. It is a ships compass that you can buy at amazon for around $24. 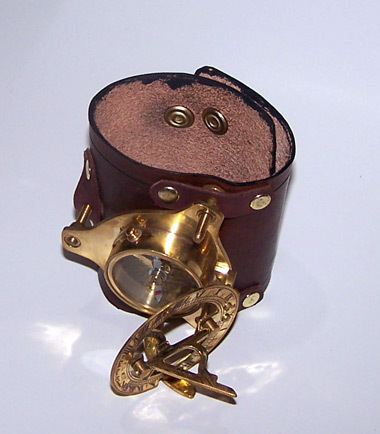 He added straps to a leather bracer to hold it in place. The only problem was this was heavy and threw itself off balance unless it was strapped down to my wrist very tightly. 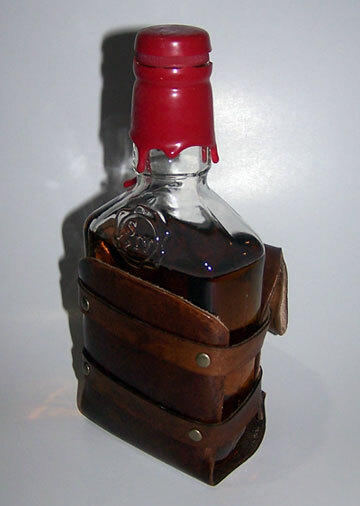 And maybe the most important feature for a Faun Steampunk mechanic, is a way to take your liquor around with you. I took a small makers mark whisky bottle and cleaned all the labels off (razor blade and spirit gum remover). I then made another pattern from poster board and then the finished leather piece. We don’t have this up on the website, but if you want one, send us a mail. It would run about $25-25 depending on the size of bottle you want us to put it around. 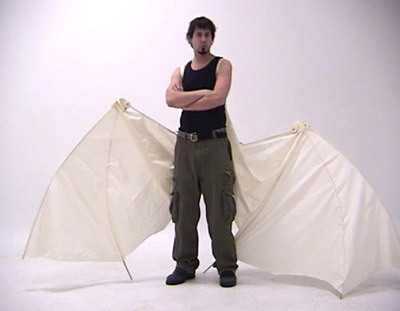 For the next version of this costume, I plan on adding large wings based on my gnome wings I made years ago. Until next time, safe journeys.